August’s Sizzlin’ Hot Summer Poetry Series: “A Conversation of Heartbreak, Love, Lust, and Loss” with fellow poets Lynnie Gobeille, Mo’ Mancini and Larry Krips at Symposium Books in East Greenwich was a great success! Photos of our reading, which was accompanied by jazz musician Mark Taber, are below. Enjoy! Larry Krips presents during the Poets’ Bar. Lynnie Gobielle in Scene 3 of the Poets’ Bar. Musician Mark Taber works his magic at the keyboard. From left, Lynnie Gobielli, Heather Sullivan, and Larry Krips in a quiet moment. From left, Poets Mo’ Mancini, Heather Sullivan, Lynnie Gobielli, and Larry Krips read their poems of love and loss accompanied by the music of Mark Taber, right. Mo’ Mancini, Lynnie Gobielle, Heather Sullivan and Larry Krips conversing at the Poets’ Bar. From left, Poets Mo’ Mancini, Lynnie Gobielli, Heather Sullivan, and Larry Krips. Poet Ira Schaeffer presents during the program’s Open Mic section. Abigail Clarkin shares at the Open Mic. An open mic session followed the Poets’ Bar presentation. From left, Poets Mo’ Mancini, Heather Sullivan, Lynnie Gobielli, and Larry Krips. Even poets get the blues on Sunday, August 9! 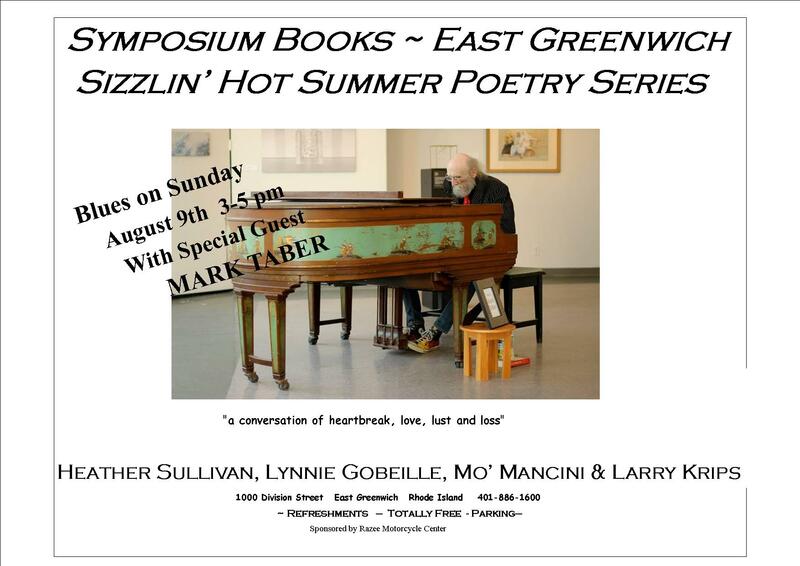 I’m excited to announce that I’ll be participating in the Sizzlin’ Hot Summer Poetry Series: “A Conversation of Heartbreak, Love, Lust, and Loss” with fellow poets Lynnie Gobeille, Mo’ Mancini and Larry Krips on Sunday, August 9, from 3 p.m. – 5 p.m. at Symposium Books in East Greenwich. Our reading will be paired with Blues on Sunday featuring a special guest — jazz musician Mark Taber. The event is sponsored by Razee Motorcycle Center, admission is free, and refreshments will be served. TIME CORRECTION: Warm up Winter with an Afternoon of Poetry! This original post had the incorrect time for the event. The correct time is February 8 from 3 p.m. to 5 p.m. Warm up your winter during An Afternoon of Poetry Sunday, February 8, from 3 p.m. to 5 p.m. at Symposium Books in East Greenwich, RI! I’ll be reading with Tom Chandler, Lynnie Gobeille and former Poet Laureate Lisa Starr. The store is located at 1000 Division Street (Dave’s Market Plaza) in East Greenwich. Hope to see you there! 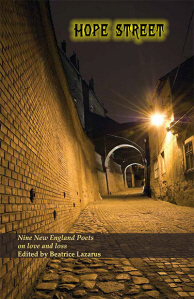 …at the release event for the poetry collection HOPE STREET: Nine New England Poets on Love and Loss! The event takes place tomorrow, Sunday, September 21, 2014, at 3 p.m. at Symposium Books in East Greenwich, RI. The afternoon will feature readings and a reception with an Open Mic, and I’ll have the pleasure of reading a couple of my own poems before introducing the nine RI Poetry Loft poets whose work appears in this collection: Nancy E. Brown, James Cronin, Michael Crowley, Diane Dolphin, Joan Fishbein, Karen Haskell, Maureen Lapre, Beatrice Lazarus, and Sandra Moran. For your convenience, the flyer is below. Hope to see you all there! I’ll be participating in Give Words a Space, an OutLoud event at the Jamestown Arts Center next Thursday, September 18. This exciting evening of poetry readings, music, and dramatic monologue will kick off at 7 p.m. with refreshments. The performance begins at 7:30 p.m. There is a $10 suggested donation at the door. Joining me are Robert Carothers, Craig Watson, David Dragone, and Rossible Kurz. You can read more about them below. The Jamestown Arts Center is located at 18 Valley Street in Jamestown, RI. For more information, visit their website at http://www.jamestownartcenter.org. graduate student at Kent State University and he has continued publishing work ever since. as the president of the University of Rhode Island. for one generation, his family has owned property in Jamestown since the mid-1700s. such as California Quarterly, Common Ground Review, Bryant Literary Review, and Avocet. the proud new grandfather of Nathan Fullerton. received the Most Valued Player for soccer in her junior year. Come to Bridgefest this Tuesday! I’m pleased to announce that I’ll be reading some new poetry (yes! Stuff making its public debut!) at BRIDGEFEST this Tuesday, July 29, as the event presents MUSIC TO MY EARS by Ocean State Poets in Jamestown. Joining me will be poets Ira Schaeffer, Dave Dragone, Victoria DuBois, Kathy Kroener, Diana Cole, Margie Flanders, Juliana Anderson, Bill Carpenter, Larry Krips, Carol Anderheggen, and Brian Callahan. Don’t miss this evening of poetry and music…make it a Time-Out-for-You Tuesday, if you will! The event runs from 7:30 to 9 p.m. at Jamestown Central Church, 99 Narragansett Street, Jamestown, RI. Hope to see you there! For more information about Bridgefest and to get downloadable schedules, visit here: http://newportbridgefest.com/. Enter your email address to receive notifications of news posts by email.